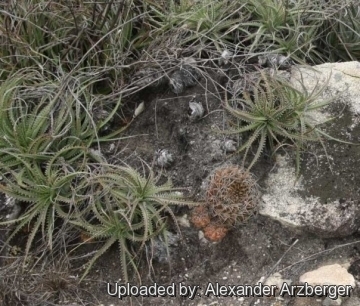 Origin and Habitat: Brazil (Mato Grosso do Sul), border area to Uruguay. Gymnocalycium marsoneri subs. matoense has been reported only in a very small area on the east of Porto Murtinho, in the Brazilian forest on the border of Paraguay, just on the east of Rio Paraguay that here forms the border between Brazil and Paraguay. Altitude range: Around 250-300 metres above sea level. Habitat and ecology: It grows at low altitudes on rock formations. 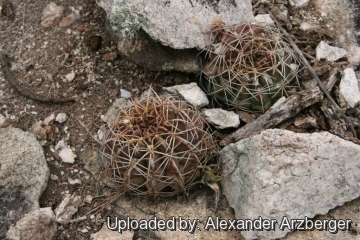 Description: Gymnocalycium marsoneri subs. matoense (firstly described as Gymnocalycium matoense by Buining & Bredero in 1975) is the Brazilian population of Gymnocalycium marsoneri. It has a rather flattened bronze-green, tuberculate body with about 21 ribs and bluish green fruits. However the distinguishing characteristics of subs. 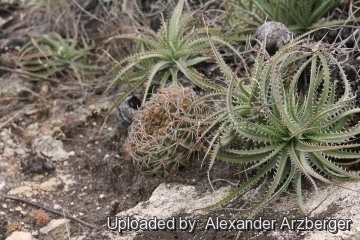 matoense, appear to fall within the natural variation of Gymnocalycium marsoneri and it should be presumably synonymized with the latter. Stem: Solitary, spherical flattened up to 15 cm in diameter and 7 cm high dull grey-green to olive-brown or bronze-green in full sun. Ribs: Up to 21, deeply, divided into large, spirally arranged tubercles..
Spines: Young areoles bears about 7(-9) radial spines, slightly recurved, 2-3 cm long, brown at first with a lighter base, then darker. Occasionally on older areoles, a central spine can be seen. Flowers: 3-3.5 cm long, 3-4.5 cm in diameter, outside brownish with bright white or greenish-white inner petals. Fruits: The ripe fruit is glaucous-green or light blue. Seeds: 1 mm long, pale brown. Gymnocalycium marsoneri Y.Itô: Widespread and variable. Distribution: Gran Chaco region of northern Argentina and southern Bolivia, Mato Grosso, Plateau of Brazil, and in Paraguay. Gymnocalycium marsoneri subs. matoense (Buining & Bredero) P.J.Braun & Esteves: has about 21 ribs and bluish green fruits. This is the Brazilian population of G. marsoneri. Distribution: Mato Grosso do Sul, border area to Uruguay. Gymnocalycium marsoneri subs. matoense cv. Multiproliferum hort. : this is a mutant that produces many suckers from the base and sides. Ribs 8-9 bright green; spines 4-7, thinner, bristle-like, yellowish-white or brownish, later grey. Gymnocalycium marsoneri subs. megatae (Y.Itô) G.J.Charles: has a large flattened body with acute ribs, and 5 thin spines spreading from the body. Distribution: Bolivian Chaco, and Chaco Boreal (Paraguay), to Porto Murtinho, Mato Grosso do Sul (Brazil) where the Chaco becomes Pantanal. 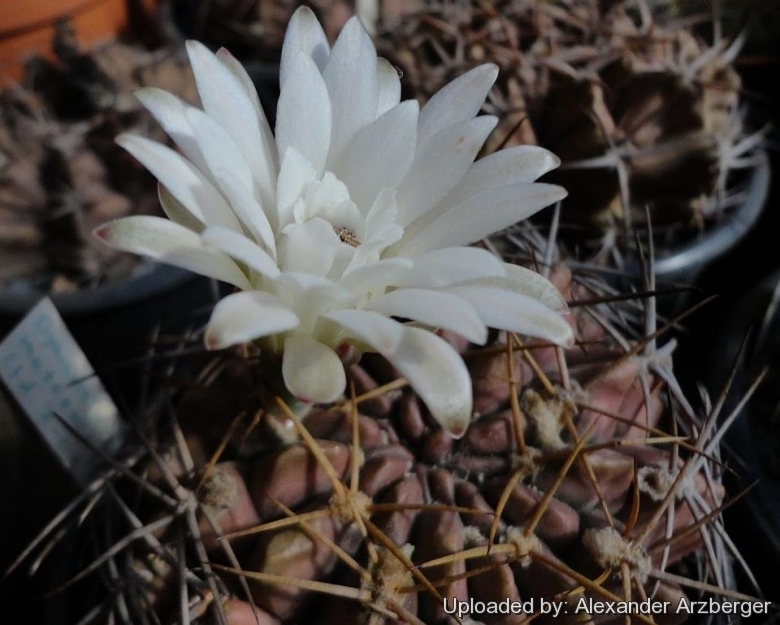 Cultivation and Propagation: Gymnocalycium marsoneri is a summer grower species that is easy to cultivate.